In recent years soil cement as a facing material for earthfill dams has been found economical where suitable riprap is not available near the site. A reasonably firm foundation is preferred so that deformation after placement of soil-cement is not significant; however, no unusual design features need be incorporated into the embankment. Normal embankment construction procedures are used, with perhaps special care being taken to ensure a minimum of embankment consolidation and foundation settlement after construction. The soil-cement is generally placed and compacted in stair-step horizontal layers. This promotes maximum construction efficiency and operational effectiveness. With typical embankment slopes of 2:1 and 4:1, a horizontal layer 8 feet wide will provide minimum protective thicknesses of about 2 and 3l/2 feet respectively, measured normal to the slope. 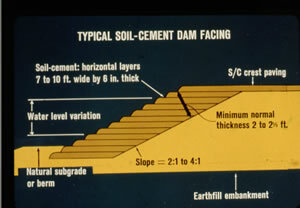 Beginning at the lowest layer of soil-cement, each succeeding layer is stepped back a distance equal to the product of the compacted layer thickness in feet times the embankment slope. For example, if the compacted thickness is 6 inches and the slope is 2:1, the step back is = 0.5(2) = 1 foot. The usual compacted layer thickness is 6 inches. Soil-cement layers of this dimension can be effectively placed and compacted with standard highway equipment. A plating method that forms a single soil-cement layer parallel to the slope is sometimes used in less critical areas for slope protection. If the soil-cement facing does not begin at natural ground level, the lower portion of the embankment should be on a flatter slope than the portion protected by the soil-cement; or a berm may be provided at the lowest elevation of the facing. It is essential that the soil-cement extend below the minimum water level and above the maximum water level. The top of the facing should have a freeboard allowance of at least 1.2 times the anticipated maximum wave height, or 5 feet, whichever is greater. The edges of the completed soil-cement layers should not be trimmed because the rounded starstep effect helps retard wave runup (fig. 6-53). Soil-cement can be made with a wide variety of soils. The principal criterion for determining soil type is gradation. Coarse sandy or gravelly soils containing about 10 to 25 percent material passing the No.200 sieve are ideal (American Society for Testing and Materials Standard Sieve Series). These soils can be adequately stabilized with from 3 to 5 sacks of cement per cubic yard of compacted soil cement. Standard compaction and placement control for soil-cement is used. If the amount of material smaller than the No.200 sieve exceeds 35 percent, some effort to find a coarse material may be justified from a processing cost standpoint. Soils containing 50 percent or more material passing the No.200 sieve are not recommended for use in their natural state. Any type of Portland cement meeting the requirements of the latest ASTM (American Society for Testing and Materials), AASHTO (American Association of State Highway and Transportation Officials), or Federal specifications may be used. Type 1, or normal Portland cement, is most commonly used because the special properties of other types of Portland cement are not usually required for soil-cement construction. Standard laboratory tests are necessary to verify the acceptability of the soil and to determine proper cement content, optimum moisture content, and maximum dry unit weight of the soil-cement. After the soil has been classified by sieve analyses and other tests, the required cement content may be estimated. Moisture unit weight curves are determined for test mixtures. The estimated cement content and at least four moisture contents are used to determine the optimum moisture content and maximum dry unit weight of the mixture accurately. A number of test cylinders are prepared, using the estimated cement content and cement contents 2 percentage points above and below the estimated content. 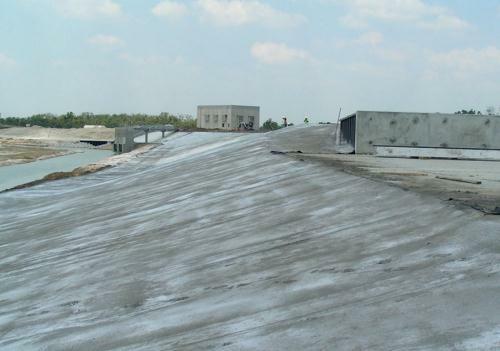 The results of wet-dry, freeze-thaw, weight-loss criteria will determine the cement content required. This cement content is then increased by 2 percentage points for erosion resistance. If it is necessary to use a soil containing more than 50 percent fines, the cement content should be increased by 4 percentage points for erosion erosion resistance. For most soils, a total required cement content of 10 to 12 percent by compacted volume of soil-cement is considered typical. Compressive strength tests for soil-cement are considered supplementary to the standard soil cement tests. Soil-cement mixtures with a compressive strength of about 450 lb/in2 or more at 7 days will generally pass the wet-dry and freeze-thaw tests. Using cement contents of about 10 percent, 7-day compressive strengths of 500 to 1,000 lb/in2 are common with a wide range of soils.